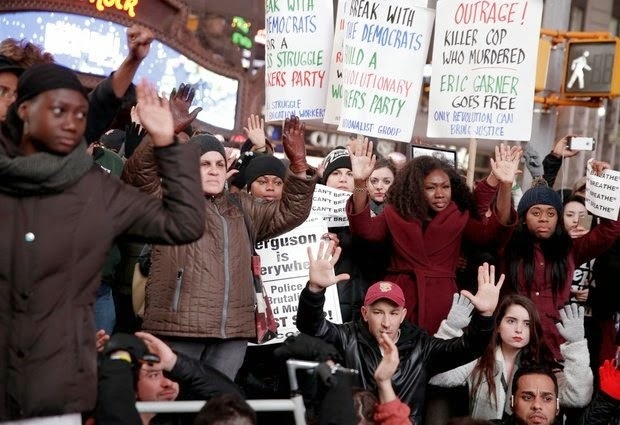 People participate in a protest in response to the grand jury's decision in the Eric Garner case in Times Square in New York, Wednesday, Dec. 3, 2014. NEW YORK (AP) — Civil rights leaders Thursday decried the grand jury decision not to charge a white police officer in the chokehold death of a black man and announced plans for a march and a summit on racial justice in Washington later this month. National Urban League President Marc Morial said the lack of an indictment in the death of Eric Garner was "a travesty of justice." He said he and other civil rights leaders are calling for 2015 to be "a year for justice and jobs." The decision Wednesday not to bring charges against Officer Daniel Pantaleo triggered protests around the country and sent thousands into New York's streets, where they marched, chanted and blocked traffic. Police said 83 people were arrested, mostly on disorderly conduct charges. Pataleo's lawyer and police union officials argued that the grand jury got it right, saying that the officer used an authorized takedown move — not a banned chokehold — against a man who was resisting arrest. And they said Garner's poor health was the main cause of his death. To find Pantaleo criminally negligent, the grand jury would have had to determine he knew there was a "substantial risk" that Garner would die. About 20 civil rights leaders met behind closed doors Thursday at the Rev. Al Sharpton's National Action Network headquarters. Sharpton said a civil rights summit will be held following a Dec. 13 march in Washington. He said the topics will include education and boycotts. The Garner case — combined with the decision by a grand jury last week not to charge the white officer who shot and killed unarmed black 18-year-old Michael Brown in Ferguson, Missouri — stirred a national conversation about race, police training and the grand jury process. On Thursday morning, yet another case was added to the mix: A white former police chief in Eutawville, South Carolina, was charged with murder in the shooting death of an unarmed black man after an argument at a town hall meeting. Garner, 43, died after a scuffle that broke out July 17 as officers tried to arrest him for selling untaxed cigarettes on the street. The last moments of his life were caught on video that showed Pantaleo holding the unarmed Garner in a chokehold as he repeatedly gasped, "I can't breathe." The medical examiner ruled that the chokehold contributed to the death. Staten Island District Attorney Daniel Donovan said the grand jury found "no reasonable cause" to bring charges. But New York law forbids him to give details on how the grand jury arrived at its decision. The district attorney said he is asking for a court order allowing some information to be released. Rep. Peter King, R-N.Y., defended the grand jury decision, saying the outcome would have been the same if Garner had been white. He said Garner's death was largely the result of his health problems, which included obesity, diabetes and heart trouble. And he said police were right to ignore Garner's pleas that he couldn't breathe. "The fact that he was able to say it meant he could breathe," said King, the son of a police officer. "And if you've ever seen anyone locked up, anyone resisting arrest, they're always saying, 'You're breaking my arm, you're killing me, you're breaking my neck.' So if the cops had eased up or let him go at that stage, the whole struggle would have started in again." Some legal experts said the Garner case, like the one in Ferguson, again raised concerns about the influence local prosecutors have over the process of charging the police officers they work with on a daily basis. Ekow N. Yankah, a professor at Cardozo School of Law, said: "It is hard to understand how a jury doesn't see any probable cause that a crime has been committed or is being committed when looking at that video, especially." Garner's widow, Esaw, said she had no faith in the local prosecutors. "As far as the police and the DA, there was no sincerity from Day One," she said on the "Today" show. Attorney General Eric Holder said federal prosecutors will conduct their own investigation of Garner's death. The New York Police Department is doing an internal investigation that could lead to administrative charges against Pantaleo, who remains on desk duty. Associated Press writers Jennifer Peltz, Steve Peoples, Jake Pearson, Deepti Hajela and Bernard Vaughan contributed to this report.